While the passing of BLADE Magazine Cutlery Hall Of Fame member A.G. Russell is unfortunate, the enormous footprint left behind by “Mr. 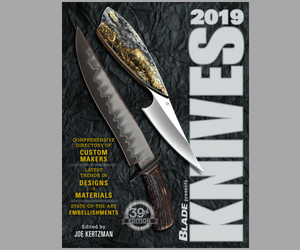 Knife” is sure to keep knife enthusiasts at full attention for generations to come. Here are three A.G. Russell knives that will likely only become more popular. It’s hard to overstate the significance of the Sting. It’s everything that a boot knife should be, from the dual hollow grinds to the handle swell. Previous iterations of boot knives more or less stuck to formulaic dagger designs. Russell defined the category by injecting better ergonomics, craftsmanship and a deceivingly simple presentation. Even if they didn’t actually stick the Sting in their boots, knife enthusiasts ate this model up after the debut in 1975. Second only to the Sting as far as sales figures go, the One Hand Opening Knife puts its lock front and center for all to see. Or, rather, front and forward. Russell re-introduced the knife in 2008, 20 years after it hit his shelves. The funky design makes it a favorite among collectors. A.G. Russell went with simplicity and an appealing price point when the FeatherLite debuted in 1993. It worked. The knife went on to sell more than 50,000 units. As Russell himself points out in the video, that doesn’t include the 11,000 units sent off to U.S. military members deployed to Iraq and Afghanistan in 2004. For enthusiasts, it’s the designer’s signature EDC knife. As one of the last designs Russell released, the Wharncliffe Lockback stands out for its innovative approach to a time-tested favorite. Here’s a look at the knife as introduced by Phil Gibbs at BLADE Show 2018.